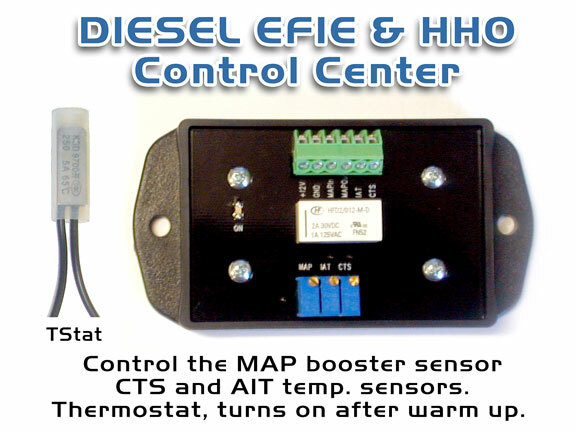 DIESEL EFIE & HHO Control Center Diesel AFR Control Module Totally Automated Tstat Activated. This unit will adapt to, and work with 95% of all Diesel powered vehicles without 02 Sensons. CTS adjustment that forces the PCM to use a leaner mapping table. If your modern truck has O2 sensors you can get the Wide Band O2 Tuning Center. Make sure you can access the sensors, that you will add wires to. Some mdern trucks have this area all covered up with a metal shrouding, to keep you out.